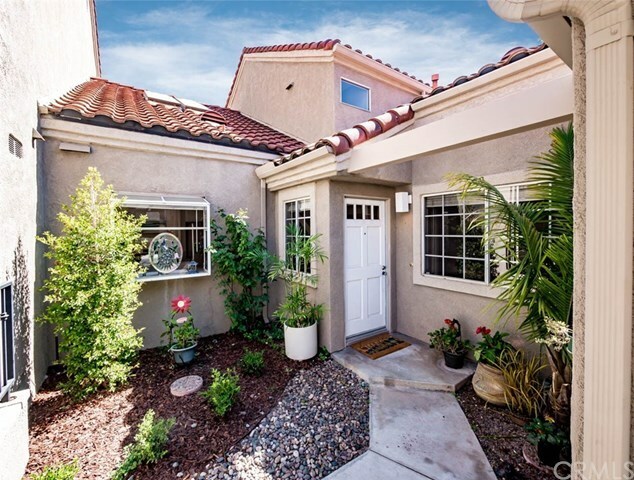 Adjacent to Lake Mission Viejo & several parks. Prime location on elevated street offering quiet, serene views to Saddleback Mountain and privacy. Gated courtyard entry plus nice backyard. Most desirable townhouse style floorpan with two true master suites- one on the main level & one upstairs with a private view balcony plus a mainfloor den/office or guest room & a powder bath. Upgraded kitchen with granite counters, white cabinetry, new stainless steel Samsung gas range, dishwasher & microwave hood as well as a French door Samsung refrigerator. Kitchen has a breakfast bar & is open to the living & dining room. Living room has soaring 2 story ceilings and skylights as well as a gas/wood burning fireplace. The backyard is private with a nice patio, planting areas, & wonderful views. Baths are all upgraded with New Quartz counters with mosaic backsplash and tile floors. Smooth ceilings. Attached direct access 2 car garage with roll up door, tons of storage. Washer & dryer included. Huge easy access floored attic storage, storage closets at backyard patio and balcony. Newer AC compressor. Enjoy close pool, spa, tennis courts and adjacent park and walk to Lake Mission Viejo Beach and wonderful amenities as well as restaurants. FHA and VA approved and we welcome your offer.